This is an popular Stainless Steel Steamer Basket, special design for 3 QT instant pot and will also fits most 3/5/6/8 quart pressure cooker perfectly. Food grade 304 stainless steel, Easy to wash.
Sturdy, quality built, works great, and easy to clean. ★SPECIAL DESIGN FOR 3 QT INSTANT POT - Fits Instant Pot Mini 3 Quart, size 3/5/6/8 quart pressure cooker or electric pressure cooker. ★CERTIFIED 18/8 STAINLESS STEEL - All components are food grade 304 (18/8) stainless steel, Sturdy and Lasts Longer. All the parts including the handle, steamer insert and the trivet are made of quality stainless steel. ★MULTIPLE USES - 3/4 inch trivet are high enough to keep above the water. Wide and holey baskets allow more ways for steam to penetrate the basket, easy to steam food evenly. 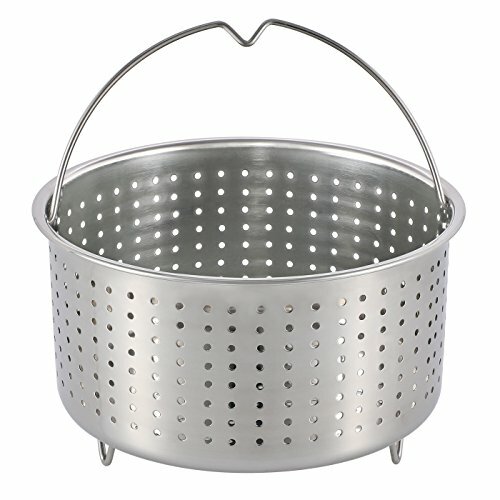 Perfect steamer basket for veggies, hard cooked eggs, you can also use it for fast straining when you are making bone broth & stocks. ★EASY TO CLEAN - Dishwasher safe, easily cleaned and no retained odors. ★AOZITA GUARANTEE - If you're not completely satisfied simply let us know and we will offer a prompt refund or replacement. If you have any questions about this product by Aozita, contact us by completing and submitting the form below. If you are looking for a specif part number, please include it with your message.